Maestro composer AR Rahman shared the poster of upcoming documentary Daughters of Destiny which is directed by Academy award-winning filmmaker Vanessa Roth. Daughters of Destiny tells the story of Shanti Bhavan Children's Project. dedicates itself for the education of poor Dalit children. 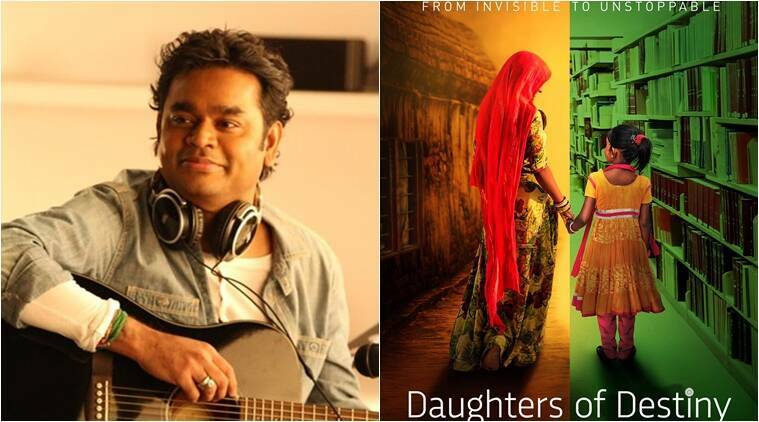 AR Rahman has composed the music for Daughters of Destiny which is out on July 28. Directed by Academy award-winning Vanessa Roth, the documentary will focus on Bengaluru-based school Shanti Bhavan, which provides free education to under-privileged children. The lives of the children studying in this school will be brought to life through this project. The story follows five girls from India’s impoverished families as they study and strive for a brighter future. Daughters of Destiny tells the story of Shanti Bhavan Children’s Project, which was established in 1997, and is centred in Bengaluru. Shanti Bhavan dedicates itself for the education of poor Dalit children who have been denied education by upper castes for centuries. Dalits are those people who were not given any position of the Vedic varna system. It supports the education of children who are as young as four year old and gives them financial help throughout college. It was founded by Dr Abraham George, an Indian American businessman and philanthropist under his NGO The George Foundation. On the career front, Rahman is busy with Tamil projects Mersal, Sanghamitra and 2.o, apart from world famous Iranian filmmaker Majid Majidi’s Beyond the Clouds which stars Shahid Kapoor’s younger brother Ishan Khatter and Malavika Mohanan. 2 Dunkirk: Will Christopher Nolan finally win an Oscar?